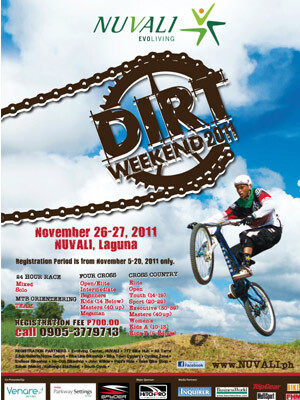 Join the Nuvali Dirt Weekend 2011! Calling all trail bikers! We’re encouraging you to check out the Nuvali Dirt Weekend 2011, one of the most exciting biking competitions south of the metro. Now on its third year, this annual event will once again take place at Nuvali in Sta. Rosa, Laguna from November 26 to 27. Sounds good? Game! In line with their vision of sustainability, Nuvali brings the biggest MTB trail race back to encourage the public to embrace nature and a healthier and more sustainable way of living through biking. Well it is true, because we’ve seen it happen before. For a registration fee of P700 per event, participants can choose between these four event categories – the Cross Country Event, the 24-Hour Race, the Four Cross, and the Mountain Bike Orienteering, all of which would require lots and lots of pedaling. The Cross Country Event will challenge riders to test their trail endurance, courtesy of a mountain bike trail that has single tracks, fire roads, and paved paths. The 24-Hour Race on the other hand will require bike teams to pedal on a short bike course from sunrise to sunset, well unto the next day. The Four Cross meanwhile is where riders can fly on jumps, zip through beams, and sprint to the finish line ala-X Games. And finally, the Mountain Bike Orienteering requires riders to navigate through the trails and complete the control points all the way to the finish line. Alas, behold the night’s main event. After a long, hard and dirty day spent riding bike trails, awesome rock bands General Luna and Urbandub will cap off the weekend celebration to keep every adrenaline in our bodies running. Biker partey! Interested participants can register at the Nuvali Evoliving Center, 777 Bike Hub, All Terra, Bike Line, Bike Town Cyclery, Cycling Zone, Endless Bike Shop, Haooh, John Wilkie, Papi’s Ride, Ross Bike Shop, Sabak, and South Cycle. Heck, you can register almost anywhere. To know more about the Nuvali Dirt Weekend 2011, log on to www.nuvali.ph or call 0917-275688. Over a thousand riding enthusiasts are expected to attend this year’s festivities, so do sign up if you do want to dirty up for an awesome day’s sake.